This weekend we spent some time up in the Woodbridge area with my wife’s family. We don’t live to far away but with everyone having busy schedules we don’t get to see them as often as we would like. 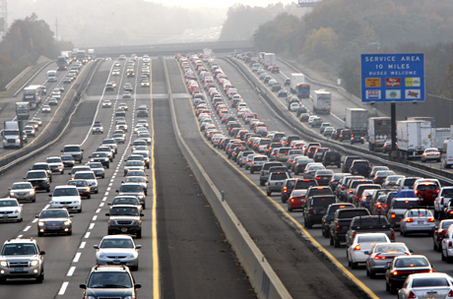 As with most places in Jersey whenever you need to get somewhere it is usually easiest to just take the Turnpike. Although it can be a gamble on whether you will hit massive traffic (more often than not), or the biggest potholes you have ever seen or possibly driven into. Luckily for us it seemed that everyone must have been avoiding the turnpike as it was nearly deserted which I don’t think I’ve ever encountered in the 15 years I’ve lived here. If you do encounter the usual traffic on the turnpike you can take advantage of the numerous service areas on both the north and south bound sides about every 15-20 miles. As an added bonus if you are a pressed coin collected each and every one of these service areas has at least one machine pressing anywhere from one to four designs. Unfortunately there are a lot of duplicates, and I believe there are only about 16 unique designs but almost 20 service areas (including locations on the Garden State Parkway and Atlantic City Expressway). A few years ago I took a few weekends and traveled up and down the entire state driving every mile of the Turnpike, Parkway and AC Expressway to collect and document all the machines and designs and as I mentioned above I ended up with a lot of duplicates. On our recent trip up the Turnpike even though there was no traffic I took the opportunity to stop at the one service area that could be accessed between the half-dozen exits between our house and our destination. I do this every so often just to see if the penny designs have changed, or have moved locations. As soon as I walked inside the machine was in the exact same place as last time, these machines are almost always located right outside the restrooms. After taking a picture of the machine I went and pressed a new set of pennies (you can never have too many duplicates for trading). Unfortunately these machines seem to get so much use that they are not always in perfect working condition. This machine however was working perfectly and all four designs came out great. Even though this service area was on the New Jersey Turnpike, for some reason the designs are almost all New York landmarks. 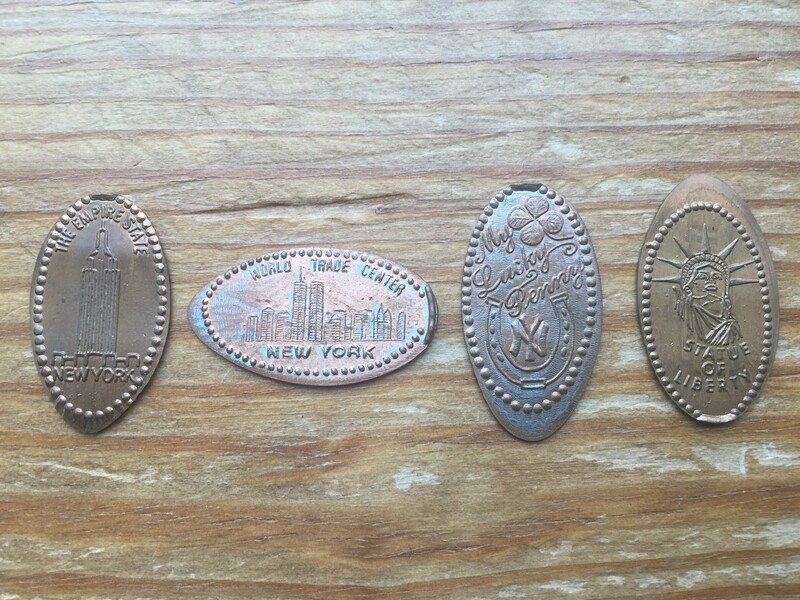 The designs included The Empire State Building, the New York Skyline, My Lucky Penny with the New York Yankees logo, and the Statue of Liberty ( which is technically located in New Jersey but always associated with New York). This summer as I take my family to the shore, or Cape Map wherever we may decide to go I’ll be sure to stop in to any service area we pass by. This way I can see how the machine is working, if the designs and have changed, and also to post on this site. 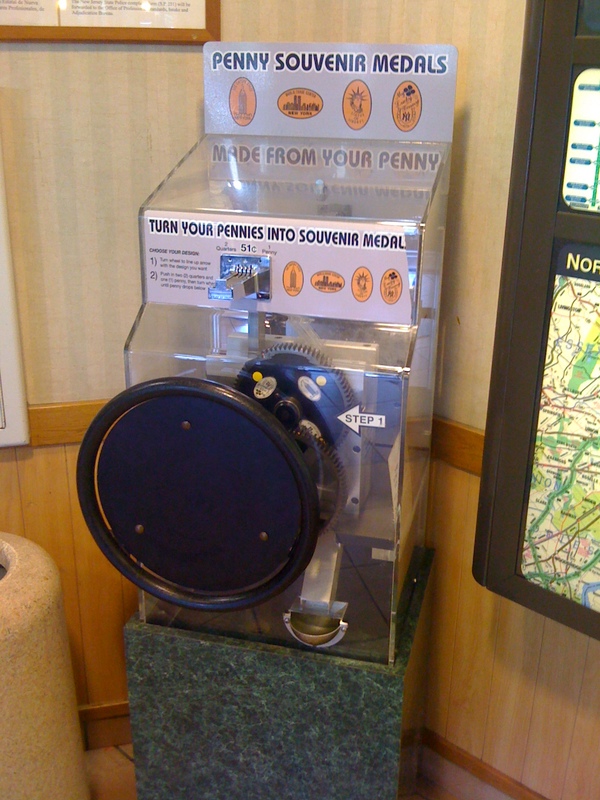 You never know when you may be traveling through New Jersey along the Turnpike, but if you are make sure to stop at one of these service areas to fill up on some expensive gas, a Cinnabon and even a few pressed pennies. They took it out and replaced it with a toy machine. Thanks for letting me know. I was actually planning on revisiting some of those service centers over the next few weeks to see if anything changed so this will be one less I have to visit. I’ll keep my fingers crossed that maybe they will finally be getting new designs.